Before the month of May entered into it's final week, 电子时尚 (Electronic Lifestyle) Magazine aka Stuff Magazine Chinese version had a launch party down at @live, KL. 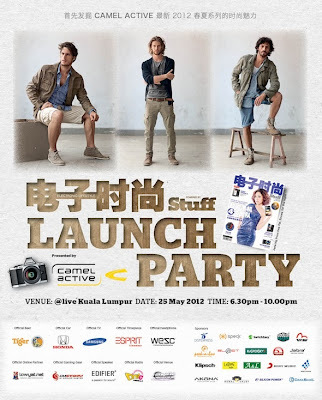 I've never been to @live, KL before but been to @live, Sunway once, during their launch. So I googled the map to avoid getting lost and to my surprise it's near Lowyat Plaza which I don't recall seeing it. Fearing the almighty jam of Friday traffic towards KL, I opted to take the LRT and monorail instead. It took me awhile till I manage to figure out where exactly it was and plonked myself down to settle with some nice cool beer. Free flow for the night, baby! I somehow had a really nice view to watch the whole event but wish I had earplugs because the speakers were really too close for comfort. I wonder how those that patronize @live, KL fare when the live performance singers come on which is a frequent affair for @live. So after the fashion show, the first segment of what a lot of people is excited about, the lucky draw! Why are many people looking forward to it, you might say (or not)? Well, it's because with the many generous sponsors, the total value of all the prizes given at the lucky draw amounts to a whopping RM50,000. Participants were to have a finger on the ground, spin 10 times, make their way to a beer bottle in front of them and put the pen that's attached to their waist with a string inside the bottle. It was a hilarious sight. The night ended for me as soon as the grand prizes were given away which concludes the event signifying the beginning of bilge drinking in the club where I passed due to my tired body overwhelming me crying for rest after a long week. Had a great drinking session during the event and am happy to have witness the grand event. I guess all the girls are chose as usherettes. LOL.